Thanks to those of you who supported this effort with meaningful contributions to the June 2018 appeal, we have now saved Lot 2, Forest Creek Road! You made this possible because you care about Nature and the magnificent Daintree Rainforest. 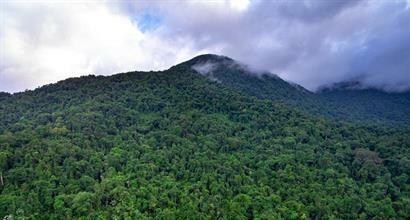 We can now add another property and its rainforest habitat to our protected list! This unique property comprises almost 4 hectares and is located on and above steep hill slopes--making this an especially high conservation value property as it contributes to clear, fresh water runoff from its steep slopes. Unprotected degraded lands produce runoff high in sediment when it rains, producing negative ecosystem consequences. As such, this property has a direct positive impact on the Great Barrier Reef which receives runoff through the Daintree's waterways. Its contribution to our growing protected rainforest areas and their impact on the well-being of the reef is another example of why this work is so important. Protecting intact habitat and promoting healthy ecosystems is one of our primary missions. And with your support we are making a real and significant difference to both these remarkable World Heritage ecosystems. Because of the hundreds of individual donations that were made towards this effort from committed supporters, we were able to protect this remarkable property. Thank you! Are you Protecting Rainforests Forever?